We opened our shop in Medford, Oregon in January 2002, and completed three orders for Aspen, Colorado in the first year. In 2003, we completed the framing and timberwork for a 4,000 square foot custom home in Jacksonville, Oregon, whose design was inspired by the works of the famous Arts & Crafts architectural team Greene & Greene. In June 2009, we moved our operations to a new facility in nearby Talent, Oregon. In early 2009, we completed a contract to supply and install the timber elements for a mountain lodge-style home in Aspen, Colorado–including 18 timber trusses and 40 timber brackets–as well as a set of timber trusses and rafters for a home in Jacksonville, Oregon. Recent projects include a a pair of timber trusses for a home in Gold Beach, Oregon, and a full timber frame home further south along the coast. If you’re a building professional looking for a reliable supplier you can entrust with a challenging timber frame structure, you’ll find SwiftSure to be an ideal choice. Easy to work with and flexible, with a reputation for thoroughness and attention to detail, SwiftSure Timberworks is committed to the creation of timber structures of lasting beauty through dedication to the highest standards of craftsmanship. Let SwiftSure prepare your timber frame structure using whatever combination of new, recycled, or distressed timbers you prefer. 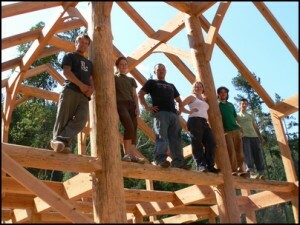 We will supply and install timber frames anywhere in North America.